A sad ending to a once proud car company. Siata produced one of the most beautiful cars of the 1950s, the Siata 208S. By the time they filed for bankruptcy in 1970, they were producing this; the Spring. Rumor has it that Siata did some market research and was convinced that this was a car the public would want. They were almost right. 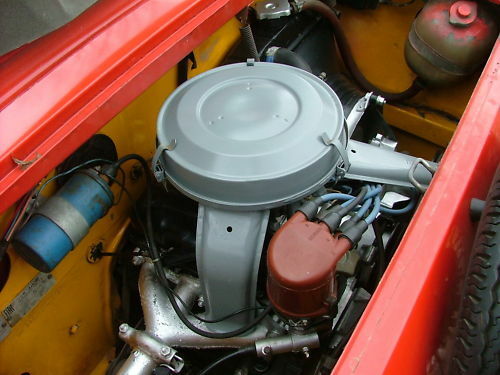 Based on Fiat 850 mechanicals and a modified Fiat 850 floorpan, the Spring was Siata's best selling car ever. The body style was based on the Siata Rallye, which itself had been based on the MG TD. 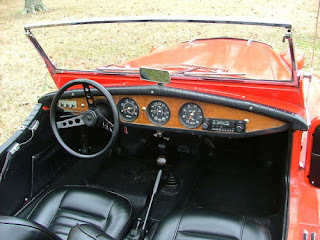 Between 1968- 1970 Siata built around 3500 Springs. That was a big number for a tiny company. Unfortunately, it didn't save them from bankruptcy. The Spring was not a great car. It was slow and not especially well built. It was also prone to rust. Even the SIATA Spring Owners club includes this sentence on their website; "SIATA made many great cars, but the Spring won't be remembered as one of them". Ouch. The seller describes this car as "an unrestored survivor". Unrestored maybe, but it has had some work done to it. 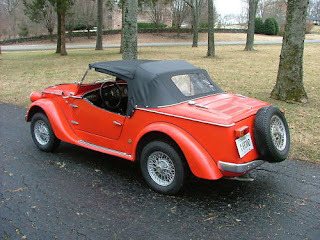 It was painted about 15 years ago, recently had the seats recovered, the wheels painted, "minor repair" done to the front bumper and grille and 2 "quarter size" holes in the floor repaired. The seller says the body has some scratches and "barely noticeable rust forward of both rear wheels above running board". He says it runs great. The Spring is a rare car today. Of the 3500 built, the Siata Spring Owner's Club estimates that less than 10% are still around. I bet this is a fun car to drive, but I've never been a fan of the styling. (Although, I had a friend who bought one 25 years ago just because be thought it was so "cool looking". He never got it running.) In my eyes it doesn't look like a Siata Rallye or an MG TD. It sort of looks like a Jeepster that got caught in a vertical press. 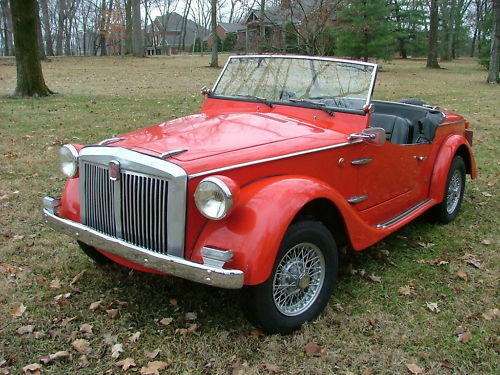 If a really obscure, rare Italian car is what you're looking for, this Siata might be a good choice. Me? I'd hold out for a really nice Fiat 850 Coupe or Spider. Located in Brentwood, TN, click here to see the eBay listing. The Siata Spring did have a very big part in the 1971 Jacues Tati movie Trafic. Fun movie which has cars very much in the forefront in the movie since it is about transporting a camper based on a Renault 4 to an auto show. I'd rather go for an Alfa Romeo Gran Sport Quattroruote. This is not my favorite style. To say it nicely. Kind a VW Thing all dressed up. I can at least appreciate the Thing’s utility and simplicity. Not this. One word UGLY. In my senior year of high school I bought one. A 1969 paisano yellow like the engine compartment on the one in the picture. Girls, Girls, Girls. and I was such a geek. Our HS head cheer leader caught me in the hall one time and publicly asked me for a ride in the car. My TOO fast a reply was, "With Me?" to which someone yelled,"Cut-Low!" She never asked again. Opportunity missed. I always saw this car as my money well spent; I paid $1,800 for it in 1970.